We’re barely enjoying the first rush of spring, but All Tomorrow’s Parties is fully hyping their new fall blowout, the I’ll Be Your Mirror festival at the Convention Hall of Asbury Park, N.J. And with good reason: the September 30-October 2 festival, curated by Portishead, has expanded their lineup. Now, reclusive Neutral Milk Hotel frontman Jeff Mangum tops a bill that includes folksy singer/songwriter Bonnie ‘Prince’ Billy, superlative New York electro-rockers Battles, deceptively sing-song experimental rockers Deerhoof, Scottish prog-rockers Mogwai, and more. Even the DJ acts have been ratcheted up, with Peanut Butter Wolf and Shepard Fairey taking spinning shifts. 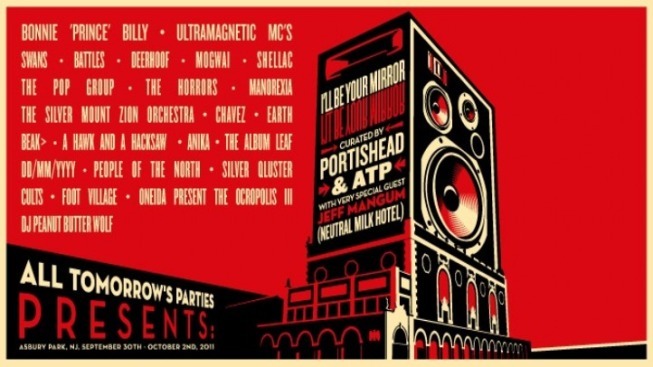 Tickets for All Tomorrow’s Parties are offered in a remarkably complex situation that includes passes sold by day ($60-$100), weekend “Portishead Passes” ($260) that do not include admission to Mangum’s show, and separate tickets entirely for Mangum ($35).